Seven Republican governors who rode 2010s tea-party political wave into office, promising that their budget-slashing, tax-cutting and bowing to corporate interests would unleash economic prosperity, are now being judged harshly by voters now that their right-wing policies have failed to deliver. Their attacks on all things Obama, on unions and on government programs designed to help the unemployed and other financially struggling people gave them varying degrees of national prominence – Rick Scott in Florida, Nathan Deal in Georgia, Sam Brownback in Kansas, Paul LePage in Maine, Rick Snyder in Michigan, Tom Corbett in Pennsylvania and Scott Walker in Wisconsin. But all but one of them now are in tight races in their re-election bids going into Tuesday’s balloting. The one who isn’t, Pennsylvania’s Corbett, is widely expected to lose by a significant margin. These states were laboratories for the kind of small-government, trickle-down economics that Senate candidates hope to bring to Washington and impose on the nation. The governors had compliant legislatures with plenty of tea-party conservatives determined to keep their economic prescriptions as undiluted as possible. Try as they might, they can’t blame “Washington” or “liberals” for the consequences of their decisions. Georgia has one of the nation’s highest statewide unemployment rates, at 7.9 percent. Florida and Michigan also have unemployment rates significantly above the national rate of about 6 percent. But even in the states that boast of lower-than-national-average unemployment rates, working families are under increased stress because of the number of middle-class jobs replaced by jobs with low wages. 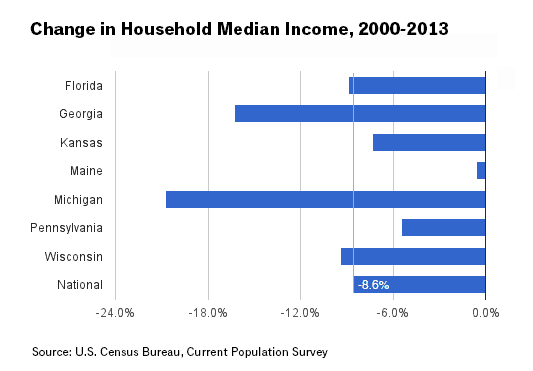 While the inflation-adjusted median income fell 8.6 percent in the United States between 2000 and 2013, in Florida, Georgia, Michigan and Wisconsin, median incomes have fallen even farther – more than 20 percent in Michigan and more than 16 percent in Georgia. None of these states have actually seen growth in median income. Meanwhile, economic growth in Florida, Georgia, Maine and Michigan between 2007 and 2013 was significantly below the national average of 16 percent, according to data from the Bureau of Economic Analysis. Among these governors, Brownback is arguably the leader in implementing conservative ideology with religious fervor. “Brownback himself went around the country telling anyone who’d listen that Kansas could be seen as a sort of test case, in which unfettered libertarian economic policy could be held up and compared right alongside the socialistic overreach of the Obama administration, and may the best theory of government win,” Mark Binelli wrote earlier this month in Rolling Stone. His tax cuts, fashioned under the guidance of Mr. Trickle Down himself, economist Arthur Laffer, and sold as a “shot of adrenaline” to the economy, ended up being a depressant instead. They led to a $700 million drop in revenue, a downgrade in its credit rating and job growth that lagged its adjacent states, Binelli wrote. The Kansas City Star adds that since January 2013, the number of jobs in Kansas increased by 1.9 percent – well below the national increase of 3.1 percent and even further below that of neighboring Colorado, which increased its job base by almost 5 percent in that period. Walker in Wisconsin, who set off an uproar when he started his term by trying to dismantle collective bargaining for state workers, pledged to create 250,000 jobs in the state in part by slashing public spending and giving tax cuts to high-income residents and corporations. He didn’t: As of September, the state has only added just over half that. “The dominant issue in the campaign is job creation and the state’s sluggish economic performance since Walker took office,” Bloomberg News reports, and as a result Walker is fighting for his political life. Scott promised during his campaign that his combination of corporate tax cuts and cuts to state government programs would enable Florida to create 700,000 additional jobs in a seven-year period “on top of what normal growth would be.” He then later dialed back the promise, according to one state news service report. In any event, the article says, job growth in the state is just what it was projected to be before Scott implemented his controversial policies. Meanwhile, economic growth in the state lagged the national average until last year, the Tampa Bay Times reported in June. In Georgia, Deal followed the same conservative policy template as Brownback, Walker and Scott, and got the same result: business tax cuts only increased budget shortfalls, unemployment remained high, incomes remained low and economic growth remained severely behind the rest of the country. “Georgia has the highest unemployment rate in the country, an unsettling position for a Sun Belt state accustomed to good fortune,” says a New York Times profile of the Senate race in the state. 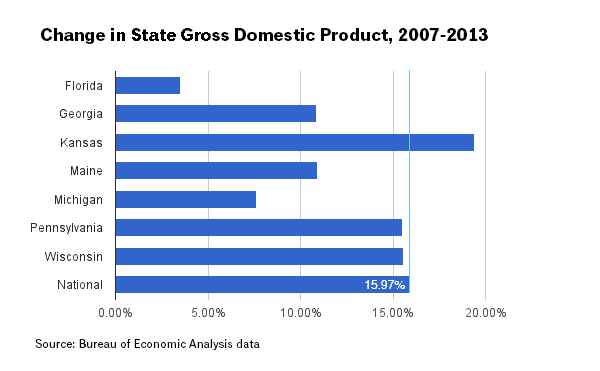 According to the Labor Department’s household employment survey, which also measures self-employment and the farm sector, Georgia has regained only 42 percent of the jobs it lost during the 2008 recession, Jeff Humphreys, director of economic forecasting at the University of Georgia’s Terry College of Business, told the Times. The story is similar in Michigan and Pennsylvania. Snyder in Michigan appears to have the political smoothness to squeak out a narrow win in Michigan despite his assault on unions and his undemocratic takeover of the city of Detroit during its move into bankruptcy, according to the consensus of polls there. But Corbett is unlikely to overcome his high negatives. Philadelphia Magazine writer Joel Mathis points to a key reason: While Corbett has basically said the Pennsylvanians who are out of work are lazy or on drugs, the reality is that Corbett’s policies have failed to arrest Pennsylvania’s slide into a low-wage economy. Then there is Maine, where LePage has added plenty of bluster to his archconservative policies. His abrasive personality is among the reasons one poll says 53 percent of Maine voters have a negative opinion of him. But the core issue is Maine’s lackluster economic growth, which a state economic commission recently predicted would remain slow. The consequences of failed conservative policies at the state level should be getting a lot more attention, because unless Democrats running for Senate do a better job of galvanizing the electorate in the final days, there is a real danger that the failed experiments in these seven states will be brought to Washington by a Senate Republican majority.